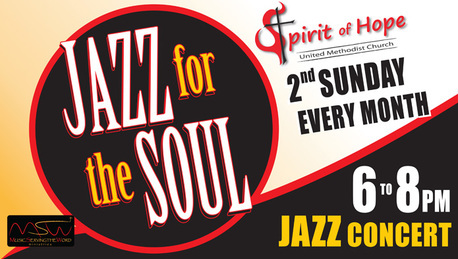 The Season Closer for Jazz for the Soul was Sunday, June 10. Watch this space for news about Season 7 beginning September 9...mark your calendar now. If you are not receiving the Jazz E-news, sign up below so you won't miss out. We promise not to use your email for anything other than Jazz news and other music opportunities at Spirit of Hope or with Music Serving the Word! Sign up for our E-news about Jazz for the Soul and receive a monthly reminder email for that month's concert. We promise to use this only for Jazz announcements. We may share your email with Music Serving the Word for news about other Jazz events in the Valley. We use "safe unsubscribe" so with a click you can stop the E-news at any time.